The drive up to the Signal Ridge Trailhead went more quickly than I had expected. As usual, Muffin and I left early (about 4:15 AM) and made it to Lincoln around 6:30. The Kancamagus Highway was as deserted as I've ever seen, and Bear Notch Rd provided a quick and scenic shortcut to Rt 302 in Bartlett. After passing through an area of construction, I located Sawyer River Rd, which had recently re-opened after being closed all winter. About a mile and a half up this gravel road, I passed the site of the deserted village of Livermore, which had been a busy logging town along the Sawyer River Railroad in the late 1800s and early 1900s. There was one house left standing which seemed to be still in use as a summer home, and nearby were a few ruins of buildings. Another half-mile up the road, I drove over a small bridge across Whiteface Brook and parked in the empty trailhead lot. 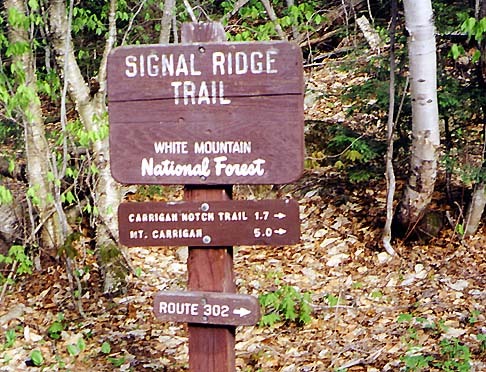 The Signal Ridge Trail starts off relatively flat, then soon crosses Whiteface Brook near where a tributary joins it from the north. The water wasn't overly high, but we still had to pick our way carefully over the rocks and across a small island littered with deadfall. On the other side, the trail followed the brook up an old logging road, passing many small cascades. It had been a tough winter for me; I hadn't gotten out to climb a White Mountain peak since last September, and I was really ready for this hike. The sound of the babbling water was peaceful and soothing. I saw quite a few birds, mostly some kind of warblers. 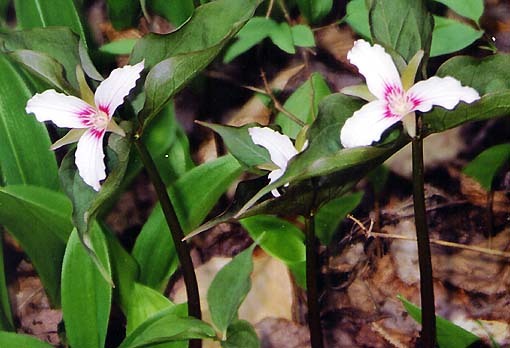 There were also numerous spring flowers, including white trillium, growing in bunches along the trail. 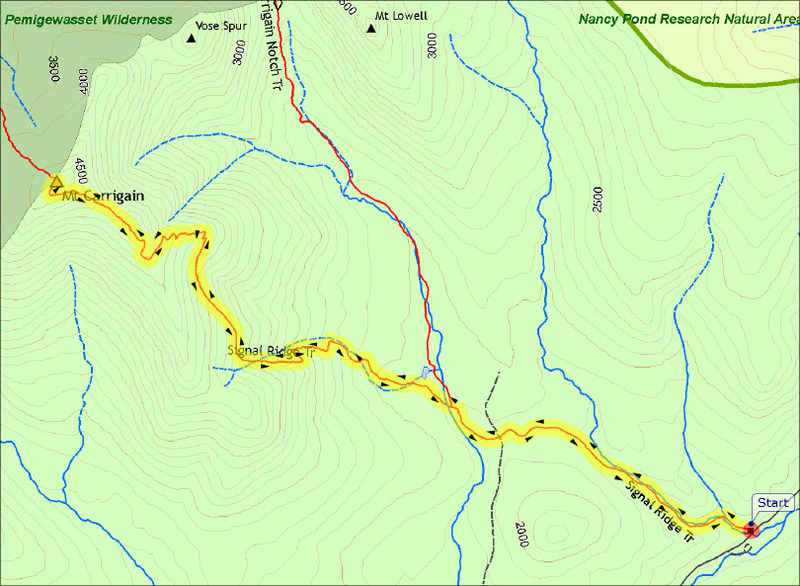 The latest edition of the White Mountain Guide, which I had just purchased a few days before, mentioned that we would be crossing Carrigain Brook Rd (an old grassy logging road) at 1.4 miles. It did look hikeable to the south, but was extremely overgrown to the north. The ruins of an old building in the deserted village of Livermore. 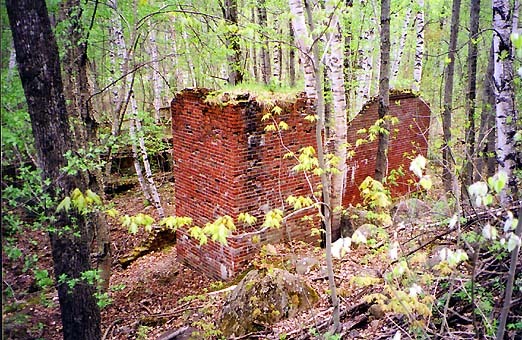 This logging town was abandoned after the Sawyer River Railroad closed in the late 1930s. Signal Ridge Trailhead. This trail begins 2 miles from Rt 302 down the gravel Sawyer River Road, which had recently opened for the season. 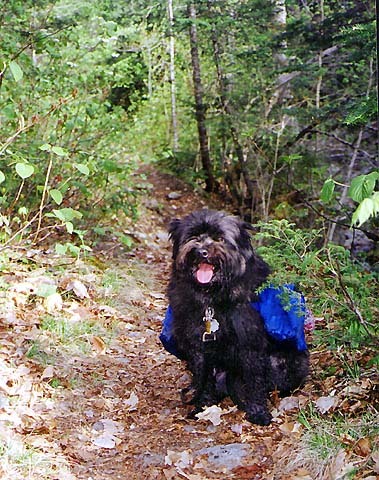 Muffin near the beginning of the Signal Ridge Trail. This trail starts off relatively flat, and soon crosses Whiteface Brook. White trillium along the trail. I saw quite a few birds and numerous spring flowers, including these trillums, growing in bunches along the trail.